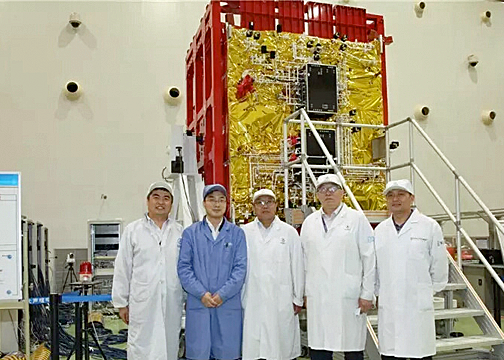 Photo of China's Shijian-13 satellite with team is courtesy of ChinaSpaceflight.com. Now in service after passing a key laser comms test is China's first HTS, Shijian-13, according to the China National Space Administration. The high-orbit satellite successfully completed a two-way high-speed laser communication test between the satellite and ground, the first of its kind in the world, the administration said in a statement. Serving users in China, the satellite will connect communication base stations in remote areas and meet the needs of distance education, digital news gathering, and emergency communication according to Li Feng, the chief satellite designer at China Aerospace Science and Technology Corporation. Shijian-13, launched from Xichang Satellite Launch Center in southwest China's Sichuan Province in 2017, has a transfer capacity of 20 Gbps and a designed orbital life of 15 years.